Can you imagine a line of urinals on the wall of an upscale dining room? It does sound outlandish, but bathroom decor may be the new style. According to a CNN Travel report, toilet-themed restaurants are in. In 2004, Modern Toilet opened in Taiwan to a mixed initial reception, but the franchise spread through Asia and has now hit Europe. In London, according to CNN, Tom Sellers just opened a bathroom-themed restaurant called Story. The establishment itself is located in what was once a toilet block. Before him, Peter Tomlinson, owner of London's The Attendant, did the same, making his cafe on the site of an 1890s Victorian toilet. "We kept everything, including the original teak Attendant's office door, which we converted into our little kitchen. There is even a 1950s hand drier still on the wall," Tomlinson told CNN. "Floors, walls and urinals made by Doulton & Paisley at their Lambeth Factory on the shore of the River Thames in 1890 are all original." Tomlinson didn't try to cover up the lavatory quality of the space. A wood counter runs underneath a line of wall urinals, creating ample room for customers to sit and eat. 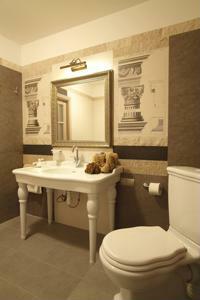 The floors are black and white tiled, the walls are of shiny white brick: all exhibiting classic bathroom style. Do you have a spare bathroom that you want to transform into a living or dining space? Instead of gutting the facilities, you may want to use them as the basis of your decor. Toilets make excellent seats, even if not used in the traditional sense. Buzzfeed shows how Modern Toilet uses these utilities as the chairs on which guests enjoy their meals. To spice things up a little, the restaurant painted the lids in bright blues and greens. Use the bathroom tile you already have on the walls and floors. Modern Toilet showcases classic small, blue square tiles on its walls. The floor has larger, black and white tiles. Whether you have a bathroom vanity or a pedestal fixture, the sink area of a bathroom can double as a place to wash dishes if you're making your bathroom into a dining nook. The shelves and cabinets that used to hold shaving cream and perfume can hold wine bottles and snacks if you decide to make your bathroom a mini lounge. Though it may be unconventional, embracing toilet-based decor may make for surprisingly good-looking interior design as well as a definite conversation piece.